I pride myself on helping anyone in need especially if they seem frightened by the pest or varmint. This story happened a couple of weeks ago. It was 11:00 PM; I just sat down in my lazy-boy chair to catch up on the late news. After a long day and evening of crawling through attics and trapping everything from mice to skunks it was nice to put my feet up and relax. I wasn’t sitting for more than 2 minutes when the phone rang. The following is another story where people overreact when a little animal takes total control and dictates the actions of an otherwise rational person. I answered the phone to a frantic female voice that seemed very desperate for assistance. Once she calmed down, she explained that there was a bat flying around in their house and they didn’t know what to do. I tried to explain to her that I trap all types of animals, however bats were not one of them. Trapping bats was not my specialty and I suggested that she call someone with expertise in bats. In exasperation she explained that she had called the experts, in fact she said that she called about 15 experts with ads in the phone book. Not one of them would come out and assist her until late the next day or the day after that. Sensing that I was destined to venture out for one more adventure, I attempted to explain to her how she or her husband could catch the bat herself. Unfortunately they were terrified of this creature and stated this would never happen. I finally conceded that I would come out under the premise that I was not a bat expert; however, I would do the best I could for them. After a twenty-minute drive I arrived at their home. The house was a huge two-story home in a very nice neighborhood in Novi. The house was easy to spot since every light was on and the front screen door was propped open. I walked up and rang the doorbell. A second later a relieved voice came over an intercom telling me to let myself in. I walked into the front hall and did a quick scan of the first floor; no bat or people. My attention was directed up the staircase were a woman’s head appeared out of a bedroom door just long enough to nervously tell me that the bat was somewhere on the first floor-then the bedroom door slammed shut. As I began to look for the bat, I thought to myself that these people must be really scared if they would let a man they never meet before enter there house at 11:00pm unsupervised. Considering that I am a big guy who has been up a very long time catching animals all day and evening and no doubt, looked as if I had. I looked everywhere for the bat. I looked in windows and behind curtains, behind pictures as well as the large vases they had. I looked in the branches and leaves of the trees and plants that seemed to dominate the décor of their home. I looked in every room and behind every piece of furniture they owned. I even went so far as to look through their dirty clothes in their laundry room. In other words, I checked every square inch of the first floor yet I found no bat. By this time the homeowners decided it was safe enough to venture down to the first floor and take a look for them. We discussed a few possibilities of where the bat may have ventured. In our discussions it was said that the front door was left open for about five minutes after they had call me for help. After checking the house as thoroughly as I did, the only explanation was that the bat must have flown out while the door was open. I explained to the homeowners that I didn’t believe the bat was in the house. I told them I would turn the lights down and wait in the kitchen for an hour to see if the bat would come out. They began to feel a little better about the situation and ventured to back to their bedroom to wait for the hour to pass. Not feeling comfortable walking upstairs and knocking on the homeowner’s bedroom door, I decided to wait for them to come down on their own. The hour expired at 1:30 am as I continued to stand in their dimly lit house waiting for a bat. An animal I knew was not here. At 2:00am I was beginning to believe the homeowners had fallen asleep on me. Finally at 2:15am the husband came downstairs and thanked me for coming out to help them-then I departed. The next day I received a very nice message from the homeowners. They were very appreciative and were very grateful that I came out even though they knew I was not a bat expert, but I was willing to help. They were able to sleep the rest of the night because I was able to calm them down and reassure to them that the bat was not interested in hurting them. I was disappointed that I wasn’t able to capture the bat that night, the experience would have been added to my expertise and I could say that bats are part of the services that I offer. The disappointment I felt the night before ended the next night with a telephone call at 2:30am with a woman screaming, “You’ve got to come back here right now, the bat is in our bedroom”. But that’s another story…. Ron Baker is the owner of Trapper Ron’s Humane Animal Removal & Relocation Services located in Farmington Hills. 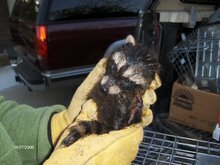 He assists homeowners and business with all wildlife nuisance issues in Farmington and surrounding cities. To Subscribe to Our Quarterly Newsletter goto WWW.TRAPPERRON.BLOGSPOT.COM. Effective immediately - Trapper Ron's Humane Animal Removal & Relocations Services we start taking appointments for the 2007 Goose Round-up slated for June. This year, we project, the goose population in Southeastern Michigan to be completely out of control. Last year the Michigan DNR trained our staff to handle the geese effectively and humanely. We have positioned our organization to handle any size goose population in any environment. The costs will vary depending on the senerio and size of the flock, however we feel that our services will be much more cost effective than our competitors. Our website has a page dedicated to our Goose Round-up http://trapperron.com/goose.html please feel free to take a look.